An important part of mandevilla care is the type of light they receive. Mandevilla vines need some shade. They enjoy bright, indirect light or filtered sunlight, but can get burned in direct, full sunlight. 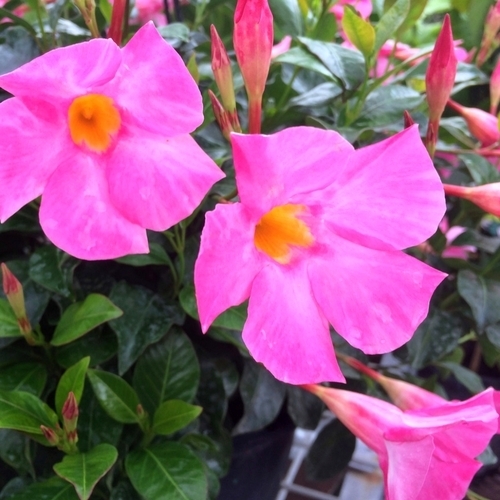 In order to get the best mandevilla flowers throughout the summer, give your mandevilla plant a high phosphorus, water soluble fertilizer once every two week. This will keep your mandevilla vine blooming wonderfully. Mandevillas are vines and they will need some kind of support in order to grow as best they can. Be sure to provide a trellis or some other support for your mandevilla vine to grow up.